The book contains inspiring work on multiple innovative solutions focused on improving well-being of children and youth in the children­focused perspective with reflection in academic theory, research and publications, and social policy documents and tools. lt presents papers prepared by authors representing international academic institutions (i.e. Department of Applied Sociology and Social Work, University of Łódź), public policy entities (i.e. the European Commission, the Ministry of Family, Labour and Social Policy of the Republic of Poland) and non-governmental organizations (i.e. Eurochild, European Social Network). 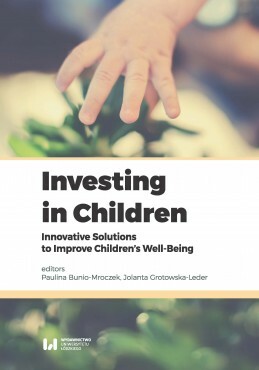 The book presents the discussion of such problems like: children’s rights, child poverty and social exclusion, early years care and education, children in alternative care, children’s health and family, parental and children support.